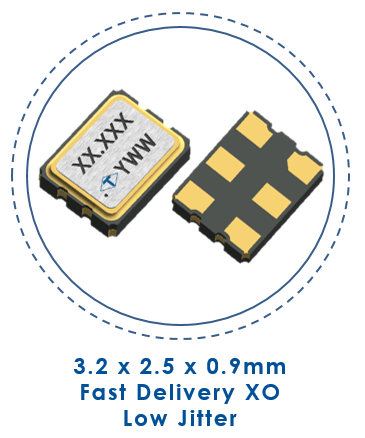 Following OT-M Type (7.0 x 5.0mm) and OW-M Type (5.0 x 3.2mm), TAITIEN added OA-M Type (3.2 x 2.5mm) miniaturized SMD quartz oscillator to the FASTXO product line. OA-M Type provides any frequencies and achieves rapid development and low phase noise. Typical phase jitter: 0.8pSec (Integrated from 12kHz to 20MHz). Operating voltage: 3.3V or 2.5V. Frequency range of LVCMOS: 10MHz to 250MHz. OA-M Type offers 3 logic outputs to choose from: LVCMOS single-ended output, LVPECL and LVDS differential output. In recent years, 5G has been commercially operating in countries around the world. 5G end-to-end high-speed communication equipments such as satellite receivers, wireless broadband networks, high-speed routers are purchased and laid out in large quantity. Tens of thousands of devices are connected in series following the rise of Internet of Things (IoT). To meet the needs of ultra-high-speed communication equipment, high data transmission, as well as the rapid product development request from equipment manufacturers for 5G and IoT, Taitien introduced FASTXO series. OA-M Type is dedicated to satisfy different high frequency requirements of 5G communication equipments such as 155.52MHz, 312.5MHz, 491.52MHz, 622.08MHz, 1244.16MHz and other frequencies required for all kinds of IoT devices.